About 350 species have been recorded in this area. The avifauna of the area has strong Himalayan affinities, and includes many species that are known from few or no other sites in Vietnam, such as Gould's Shortwing, Yellow-billed Blue Magpie, Crested Finchbill and White-collared Yuhina. 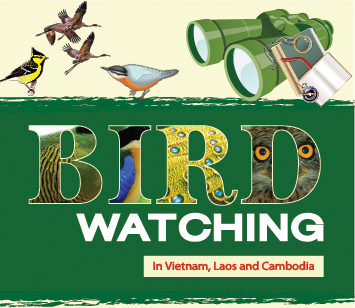 Although bird richness is high, abundance, particularly of medium-sized birds, is low, relative to certain other forest areas in Vietnam, and a considerable amount of effort is needed to see a high proportion of the area's specialities. Beautiful Nuthatch, Red-tailed, White-browed and Black-faced Laughingthrushes, Streaked and Spectacled Barwings, Blue-winged, Chestnut-tailed and Red-tailed Minlas, Black-headed Sibia, Vinous-throated, Ashy-throated and Golden Parrotbills, Mrs Gould's Sunbird and Black-headed Greenfinch. Ham Rong Orchid Garden: The Ham Rong Orchid Garden is found behind Sa Pa town, with access to it along the road behind the church. The garden comprises a series of ornamental gardens, linked by pathways, all of which reward careful exploration for birds. With a bit of searching, Brownish-flanked Bush Warbler, White-browed Laughingthrush and Ashy-throated and Vinous-throated Parrotbills can be found year-round, while, during the winter, the site is good for passerine migrants. Fan Si Pan mountain: All three trails to the summit of Fan Si Pan mountain (from Cat Cat village, Sin Chai village and Tram Ton pass) are good for montane species, particularly higher elevations. The trails are difficult going in places, and can be dangerous during bad weather. Therefore, it is inadvisable to attempt any of these routes without a guide, or to attempt them at all during the rainy season.